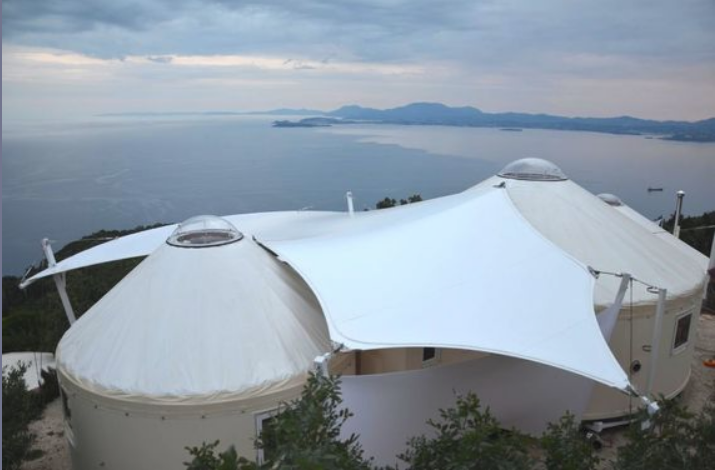 Perched on the top of a hill with expansive views, this retreat center opens up to incredible views of Greece and Albania across the Ionian Sea. With beautiful open views on a south-facing slope comes both full sun and wind exposure in this hot mediterranean climate. The location has breathtaking views but the challenging access up tiny dirt roads meant that only smaller trucks and cars would be able to access the site. The owners approach to developing the site was to build with lightweight ecologically conscious methods that would minimize the amount of material delivery needed. They started by building three yurts on the land then found and hired us to create beautiful shade and rain protection outside and around the yurts. Existing lightweight structures were built without plans and needed to be designed around. Site required about a day to travel to and weeks to ship materials to. Met the immediate shade need and allowed client to host an early summer event at the center. Allowed us to spend time on the site and get additional site measurements and build an accurate 3D computer model. Allowed the Client a “test run” of what the structure would actually look and feel like on the site. Established permanent anchors in several locations that would remain the anchors for the permanent installation. After using the space for the spring and summer the client was able to identify some adjustments to make for the permanent version. This included the addition of a fully enclosed kitchen/dining area and more shade for the upper decks but more sun on the lower decks. With this new information based and the detailed measurements and modelling we had done, we were able to design a custom tailored fabric structure that worked harmoniously with the site and gave them the sun and shelter that was most desirable. All these pieces were able to be fabricated and shipped from our shop in Portland and assembled in Greece with cables made in Europe. The fabric structures have been now been enjoyed by countless appreciative visitors. Beautiful views require beautiful architecture.